Our intensive curriculum takes traders from point A to point B; teaching someone that knows nothing about day trading and giving them all of the combined knowledge and tips from our careers in the industry. One of the most important things that we teach our day traders is the ability to read and understand the market. When we really understand how the market moves, (and most importantly why the market moves the way it does) indicators become secondary and the market becomes the primary thing we pay attention to. It’s the market that we are trading after all, not indicators. More experienced traders who join us find our Intermediate and Advanced sections of the course address a number of techniques that will help reduce your risk and let your profits run. Many traders use our method and techniques as a foundation for other markets to reach profitability. It is about being able to develop the correct discipline, patience, and view of market in the right context. We also have an invitation only Professional Traders room (Pros room), where you will be trading with fellow DTA Pro’s, helping each other with new trading strategies and setups while advancing your trading and profits at the same time. Our rules-based approach to trading is extremely flexible for all types of traders. We give you a proven skill set and you choose what you are comfortable with as a trader. In the beginning it is important to follow the patterns we highlight, to gain market aptitude. Once you’re feeling more comfortable, we will begin to make small changes to trade entries, exits, and risk management. It isn’t about making a million dollars every day. The goal is be able to make money consistently every single day. It is learning how to be reliant on yourself, so you can focus on the actual movement of the market. To be successful in this business, you truly need to understand how the market works based on Price Action and NOT Indicators or software. By keeping a simple chart, we can immediately assess how the market is performing and profit from the potential opportunities given to us. Our strategy uses a few indicators that help with volatility and momentum, but our main objective is to understand the market environment and adapt to its changes by reading live price. Indicators are tools, not the answer to success. Success lies in sound judgment when trading and knowledge of why the market moves the way it does. This understanding will keep you in good trades reaching your profit targets, and keeping you out of bad trades that appear enticing. 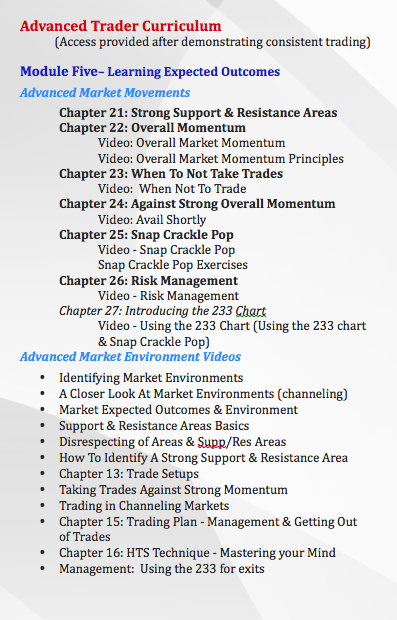 After students demonstrate their ability to read the market, we can incorporate advanced or pro trades. 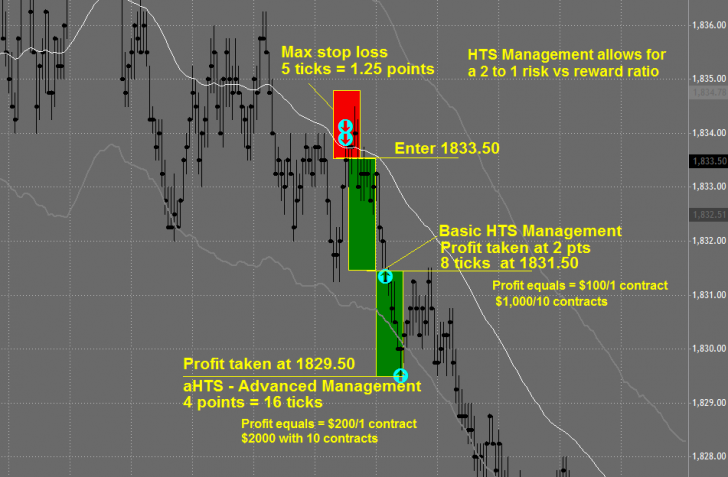 Advanced trades are trade setups that fit the basic rules, but also allow for dynamic profit targets. 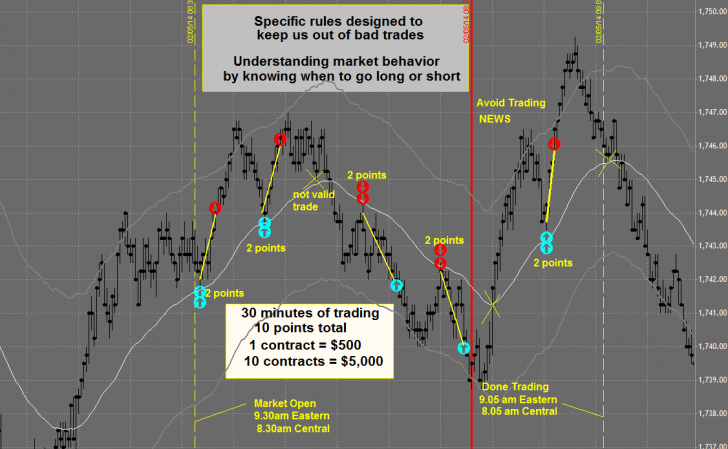 Pro trades are trades that do not fit the “classic rules,” but are extremely compelling and high probability. There is an average of two million contracts traded daily on the S&P 500 E-mini, making it the most traded market in futures. This large volume creates a fluid market that is ideal to learn on, as so many active positions create numerous trade opportunities throughout the day. We see fluctuations in market volume seasonally, and our students are successfully learning to trade the E-mini S&P 500, because we teach them how to understand the market and focus on one market at a time. This concept is what we call “Congressive,” where we are conservative when the market is not moving well and aggressive when the market is trending. Sometimes we make exceptions to our profit target by reading underlying behavior; this is a skill we teach our traders to understand and take advantage of market momentum. Trading full time is all about being able to generate consistent returns. 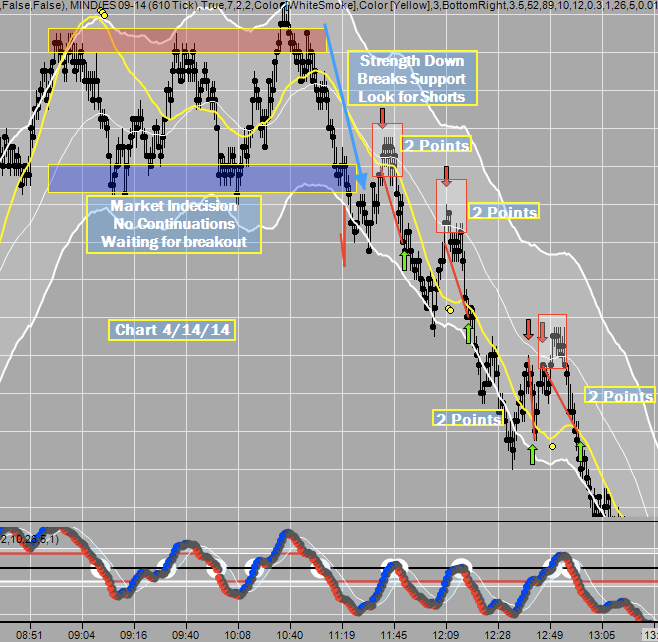 One aspect we focus on is identifying which trades appear valid, but are not compelling. Day trading is a community and our new pool of Master Traders are helping to take advanced and pro traders to the next level as well. A day trading coach will help you improve as a trader based on your actions in the market. Day Trading Academy also provides feedback and reinforcement on your trades through video analysis of all your charts. This approach helps identify and strengthen weaknesses. Our live trading room is where we put all of our concepts into real time action. We always prefer to train in a live market environment to ensure that we learn the correct market expectation. Everyone who runs the live trading classes, or is involved in mentoring, is an accomplished trader. Our instructors have been through our training program and are now doing this for a living. Imagine the difference you would feel by knowing that others are trading live with a strategy that you’re using. The live and recorded classes result in a dramatic reduction to your personal learning curve, as you will see and hear professional traders evaluate their positions, handle themselves under pressure, and most importantly, how they handle risk management while in the trade. We are sure you may have more questions and need more information. That’s why we have prepared a Day Trading Guide that you can download for FREE with our compliments. If you would like to be considered to join our DTA Training and Mentoring program and would like one of our Trader’s to give you a call anywhere in the world you are, please click here and fill out the form, and someone will contact you at your specified time and number. If you want to learn more about program opportunities follow this link or call 1-800-645-6349 (USA). You may also enter your email to receive our free newsletter with exclusive events, such as live trading class invites and exclusive webinars.